Early day photo of Trailblazers founder A.F. Van Order and his family. Such was the case almost 80 years ago in Southern California, when people involved in racing there wondered what had become of some of the greats of the sport who had thrilled them years before as they sped around the legendary board tracks at Beverly Hills and Playa del Ray, as well as dirt tracks on the west coast. One of the leaders in the effort to reunite those old motorcycle racing gladiators was Ashley Franklin Van Order, who went by A.F. Van Order or ‘Van’ to his friends. 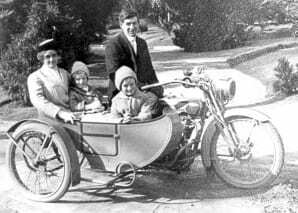 He moved from Illinois to the Los Angeles area in 1911, went to work in a motorcycle dealership and, for a while, did a little racing. As the years went on, he traded his race bike for a pad of paper and a camera and began doing photography work at events and writing for some west coast magazines. For many years he produced a page in The Motorcyclist magazine called “Thirty Years Ago with Van.” It was a look back at racing and the industry in the early 1900s.